Characters Unlimited, Inc. has improved upon the classic fortune telling machine by incorporating low-maintenance animatronics, modern technologies, and excellent craftsmanship into a beautiful product that is built to entertain for decades to come. 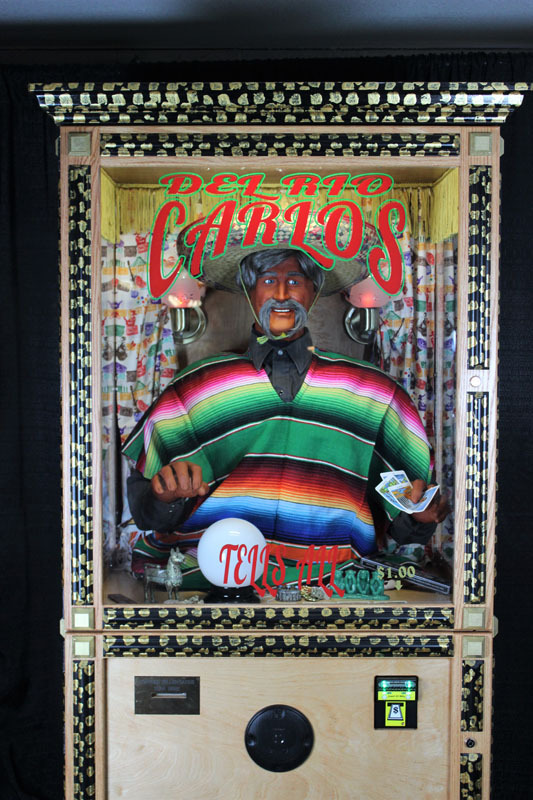 We make fortune telling machines of many themes and styles. Every fortune teller is made-to-order and can be customized to your satisfaction. Fortune telling machines are perfect to use as an attraction at your place, a revenue generating machine, or as a marketing or promotional tool. Fortune cards can be custom printed with your logo or promotion. Let us make your brand figurehead, mascot or store theme come to life with our custom fortune telling machines! We have 3 Fortune Teller models and sizes for you to choose from. Our Deluxe model includes the same features as the Standard model however, the cabinet is larger and more lush. For an additional $500, you can upgrade from the Standard to the Deluxe cabinet. All of our fortune tellers are made to order. Follow the steps below to order your dream fortune telling machine. Pick from fortune tellers that we have made in the past or create your own. Specify the stain or paint color you would like on your fortune teller cabinet. Decide if you want custom messages for your machine and if you want to add a wireless microphone to speak live through the fortune teller. Decide whether you will need custom fortune cards made or if you will use cards that we always have in stock (each machine includes 2,000 of these). Decide if you will need additional features like an attract message, a wireless microphone, motion activation, a travel case, an additional lock, etc. We have made a variety of fortune telling machines.